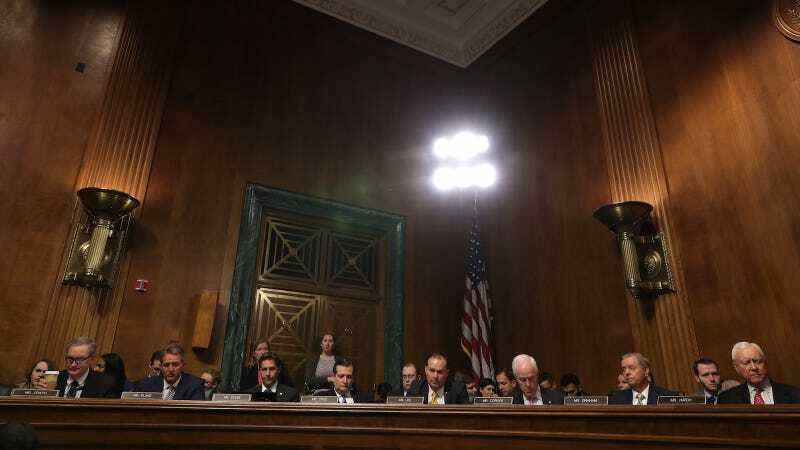 On Friday morning, hours after Dr. Christine Blasey Ford offered grueling, heartbreaking testimony about being sexually assaulted at age 15 and Brett Kavanaugh, while lying through his teeth, yelled about being good, Republicans barreled forward with a confirmation vote. Along party lines, they voted 11-10, in support of advancing Kavanaugh’s nomination to a full vote on the Senate floor. Still, the hearing ended in confusion, as Arizona Republican Sen. Jeff Flake, at the 11th hour, called on the White House to order an FBI investigation before the vote takes place. Yet no motion was passed, and no formal agreement is in place that any such investigation will happen: Committee chair Chuck Grassley abruptly ended the session and only verbally committed to “Gentlemen and women’s agreement” regarding a “brief” delay on the full vote pending the request. Kavanaugh’s confirmation now lies in the hands of four self-described undecided senators who could threaten to vote “no” unless there is an investigation: Republicans Susan Collins of Maine, Lisa Murkowski of Alaska, Jeff Flake of Arizona, and Democratic Sen. Joe Manchin of West Virginia. At the start of the hearing, Connecticut Sen. Richard Blumenthal called for a motion to subpoena Mark Judge, Kavanaugh’s high school friend who, according to Ford’s testimony, was in the room when she was assaulted. Judge has not been questioned by the Senate Judiciary Committee or the FBI, and has not submitted a “detailed account of what he knows,” Blumenthal said. “We cannot in good conscience vote without hearing from at least Mark Judge,” he said. He also called to hear from “other sexual assault survivors who have come forward with credible, powerful stories.” The motion was defeated along party lines by one vote: the size of the majority Republicans hold over Democrats on the committee. At that point, several Democrats on the committee left the room. During this process, Republicans have stonewalled witnesses and other accusers, held off an FBI investigation into Ford’s claims, effectively put Ford on trial by hiring a prosecutor to question her, and openly sympathized with Kavanaugh. The answer is yes. The question ahead is whether the Senate at large will do the same. Update 9/28, 3:25 pm: Sens. Manchin and Murkowski, two of the undecided senators, support Flake’s call for a limited, one-week independent investigation. Update 9/28, 4:08 pm: Reuters reports that the Senate will vote on a motion to proceed, the first step to taking the confirmation vote to the Senate floor, on Saturday.